Those words were first spoken twenty years ago and sent people flocking to movie theaters to find out just what the Matrix was. When The Matrix came out, I was going through a phase of spiritual exploration, with a particular focus on Gnosticism, so the premise that reality is a dream controlled by malevolent forces resonated with me at the time. 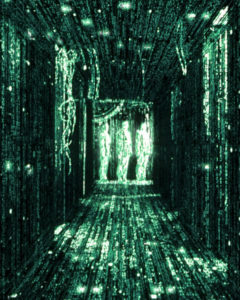 Although the number of essays and books written about the movie and its implications has waned over the years, the imprint left by The Matrix on pop culture remains to this day. Despite the adoption of the term “red pill” by conservatives and various elements of conspiracy culture (proving once again that the Right continues to steal imagery from the Left), The Matrix is a very anti-capitalist movie as shown by its literal use of human resources, a theme the Wachowskis would revisit in their later movie Jupiter Ascending. These words spoken by Morpheus could easily be spoken by any anarchist on the street today. But to paraphrase Slavoj Žižek, The Matrix functions as a Rorschach test that allows everyone to read their own “-ism” into the movie. This philosophical ground has been covered before by people with more letters after their names than me. In the succeeding two decades, we may have replaced minidisks with flash drives, and those cool sliding phones with rather boring-looking smartphones, but we have constructed our own Matrix. It is not as all-encompassing or as sophisticated as the one in the movie, but it is there. This is a world we started building long before The Matrix came out, but with the advances of technology, it seems to have accelerated. We now have social media which engineers have admitted is designed to be addictive. Who needs a jack in the head when one has a smartphone and an internet connection? We have the people “inured to the system and not ready to be unplugged” as shown by studies where people cannot give up their phones for even a few hours without profound anxiety often called nomophobia. We even have the term FOMO (fear of missing out) which is really just a fancier term for loss aversion, the fear of being disconnected in our over-connected world. No one wants to face the Desert of the Real. And this is one of the central themes of The Matrix: alienation. In the movie, human beings are alienated from the (destroyed) natural world and from each other, contained in their own individual pods. In our own world we are in a world plagued by climate destabilization and the profound social alienation of modern life. While people are more connected than ever before, for many, close personal ties are simulated, in that they can add someone to a friends list and like their posts, but never actually meet and talk to them. Many people see there is something wrong with the world, but the reactions are different. In the world of the mainstream, where Republicans and Democrats squabble with each other, but deny there is anything actually wrong at all. They go on with their lives downloading images and thought-forms from mass media and wake up in their beds to believe whatever they want to believe. Then there are the authoritarians and would-be fascists who acknowledge that there is something wrong, but like the character of Cypher, are only concerned with using it to leverage their own power and position within the system. The final faction, the anarchists, dissenters, and outcasts of all types, those who were forced into the Desert of the Real for various reasons (poverty, proscribed identity, and so forth). They all see there is something wrong with the world. Some try to fight against it, but many are simply seeking out their own Zion, a place to be free of the controls of the system. These are the people who cannot be assimilated to this world of perceptions. In the sequels Reloaded and Revolutions, it is revealed that the Matrix has a failsafe, the Architect’s plan with other iterations of the One and the continued destruction and rebuilding of Zion. Our own Matrix has its own failsafes, among them a strong emphasis on conformity, and the ability to pass off its systemic flaws as individual failings. And it has its own Agents, that we often call the police, but is really just the power of the State. Our surveillance systems are not as omniscient as the Matrix, they are becoming more ubiquitous and allow for the rapid deployment of Agents to quash any form of descent. And yet the problem does not go away, for the Machines in The Matrix nor in our world. The Machines have to continually destroy and rebuild Zion, while our world system has yet to figure out what do with all those that do not accept it. And this is our opportunity. For all of its dystopianism, The Matrix ends on a note of hope that still resonates to this day. We still have a choice of where we want to go, it is not an easy choice and many would rather take the blue pill and check their social media feed. But if enough of us walk away, and are willing to face the Desert of the Real, we can have that world. A world without rules and controls, borders and boundaries. Unlike in the movie, we cannot let the system decide. This choice is up to us. Andrew M. Johnson is an artist and writer living in Arizona. Read other articles by Andrew M.. This article was posted on Sunday, March 24th, 2019 at 8:10am and is filed under Film Review, Philosophy.